Habitat: Desert. This wildflower often grows on rocky slopes. Description: The flowers are 1 inch (2.5 cm) wide and have 5 cupped petals. The flowers are followed long, fuzzy, brown bean pods that become woody and twisted and split in half when dry. 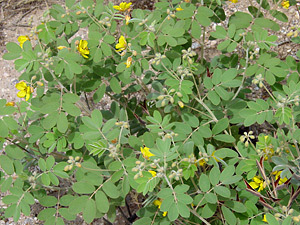 The leaves are dull green to gray-green in color and pinnately compound with 2 to 3 pairs of elliptical leaflets. The stems are thornless, tan in color, and covered in fuzzy hair. 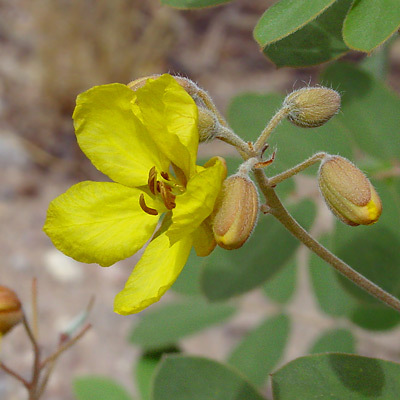 The similar Twinleaf Senna (Senna bauhinioides) has leaves with only a single pair of leaflets, while Velvet Leaf Senna (Senna lindheimeriana) has leaves with more than 3 pairs of leaflets. Butterfly Plant – This is a favorite food plant for Cloudless Sulphur (Phoebis sennae) caterpillars. If you find a Coves' Cassia with chewed leaves or flowers, look for one of these caterpillars on it.